Less than £1m a year in new funding has been set aside for the government’s 25 year environment plan, Unearthed has learned. 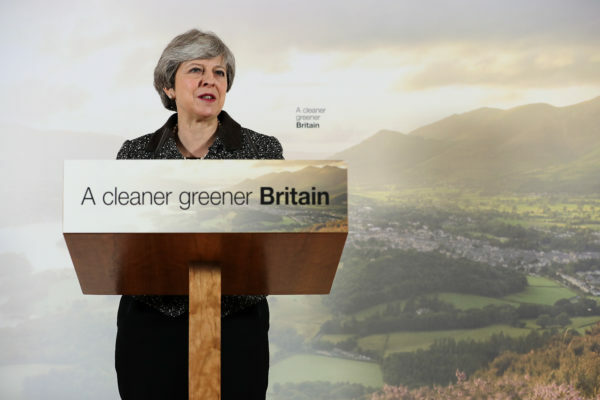 Theresa May promised “global leadership” on environmental issues from plastic waste to animal abuse when launching the strategy last month. But so far only £15.7m in extra funding has been set aside for the strategy, it emerged in a recent parliamentary question posed by Green Party leader Caroline Lucas. She described the extra funding – equivalent to less than a penny per person per year in the UK over the course of the plan – as a “pittance”. The government is still developing the policies in the plan, which is likely to be updated, so further funding may be announced at a later date. It also draws on funds that had already been announced elsewhere. The plan follows cuts in recent years to the Department for the Environment, Food and Rural Affairs (Defra) and other relevant government agencies. Campaigners and politicians have criticised the 25 year plan for a lack of legislation, funding and short-term action. Some of the targets announced are years old (pdf), such as the goals of increasing woodland cover in England to 12% by 2060 or ending the sale of petrol and diesel cars by 2040. Others, such as targets for managing exposure to chemicals, are already required under international law. Environment minister Thérèse Coffey told parliament that funding for the plan includes £10m for a project to help children explore nature, £5.7m for tree planting in northern England, £3.5bn for air quality and £5.8bn for helping developing countries tackle climate change. But Unearthed has identified that the money for climate change was announced in the foreign aid budget in 2015, while the air quality funding is an accumulation of money spent since 2010 (pdf). The government has also cited existing funding available through farming subsidies as available to support the plan, after environment secretary Michael Gove announced a revamp of the system in January. However no announcement has yet been made on the proportion of funding that will be redirected to countryside conservation. A Defra spokesperson told Unearthed: “Our 25 year environment plan builds on substantial existing investment – such as the £3.5bn we’re investing in improving air quality and the £2.5bn we’re spending on flood defences. It also commits new funding to improve habitats for wildlife, connect children with nature and support the Northern Forest. Defra has faced some of the biggest funding cuts of any department over the course of the Conservative government. One week after Theresa May’s speech, which focused on eliminating plastic waste, it emerged that the government body responsible for tackling waste is making 10% of its staff redundant. And in 2016, Unearthed published leaked documents showing the environment watchdog Natural England was planning to rein in its regulatory powers and seek funding from the corporations it assesses, in the face of a 27% budget cut. But Ellie Brodie, senior policy manager at the Wildlife Trusts, told Unearthed targets “will need effective monitoring and resourcing over the long-term from Natural England”. It is not yet clear how some new targets set out in the plan will be funded. In her speech, the prime minister condemned the “environmental scourge” of plastic pollution, promising to eliminate all avoidable plastic waste and significantly reduce plastic pollution in the oceans. The government is believed to be considering charges on some single-use plastics and a deposit return scheme for drinks containers. The plan promises to restore 750,000 hectares of protected sites for wildlife, as well as 500,000 hectares of mostly priority habitat outside protected areas. A report for the RSPB, National Trust and Wildlife Trusts recently estimated the costs of maintenance, restoration and expansion of all of England’s priority habitats – close to 2m hectares – to be £876m per year. The government did not respond to requests from Unearthed to clarify the details of new wildlife funding, which do not appear to be in the plan. Defra committed to flood spending for the period from 2015 to 2021 three years ago, which is an increase on previous parliaments.